When I took my last car in for warranty work they asked me to unplug my camera. Not going to do that again. I have both front and rear and when the shop asked me to do that I said no and for them not to touch them either. I notified them in writing on the service ticket that both are active and recording both video and voice, that's all I need to legally do. I suppose they could have refused to work on it but I don't think Infiniti would like that. They had my car for 3 days too. That's a huge rescue hoist housing on that bird...what's in there? 2 electric hoists. 295 feet of cable each. 0-300 fpm. The second hoist is a backup in the event of failure or cable fouling. I've never heard of a backup hoist...you Canucks are certainly serious about your SAR. When I got the truck back, I walked around it (I always check everything after a shop has had it). It’s got the 20” painted rims on it and every rim was scratched! Not horribly and not from changing the tires. It looked like someone had laid them face down on the floor and then dragged them when picking them up. Just enough to make them look like scratched up crap. I was pissed! I brought it up to the counter guy and he said I’d have to come back and talk to the owner at the end of the day. Every body shop I go to wants to paint all the rims and the fender/door. I’m not overly keen on that. The ford black is notoriously hard to match and I don’t want to have a new truck that a respray fades to a slightly different shade in a few years. I understand what the shops are doing: they want the payday and they don’t want to put out work that doesn’t look perfect. A respray is the quickest way to both those objectives. I just recently detailed a brand new Ford Raptor. The dealership had to repaint the rear driver's side truck bed due to a deep scratch already in the brand new truck. I PREDICTED to the owner that after doing the repair and painting the effected area the dealership body shop would do the normal hack work they are known for and true to my prediction they did. Now the brand new truck has a BLEND LINE. I remove their holograms but the blend line will be there forever. So sad a dealership in the year 2019 can't do quality work. Lesson from the above story - be very careful who you let work on your truck. It's hard to find quality body shops that actually know what they are doing. I'd find a shop that specializes in JUST rims and let them do the re-paint. 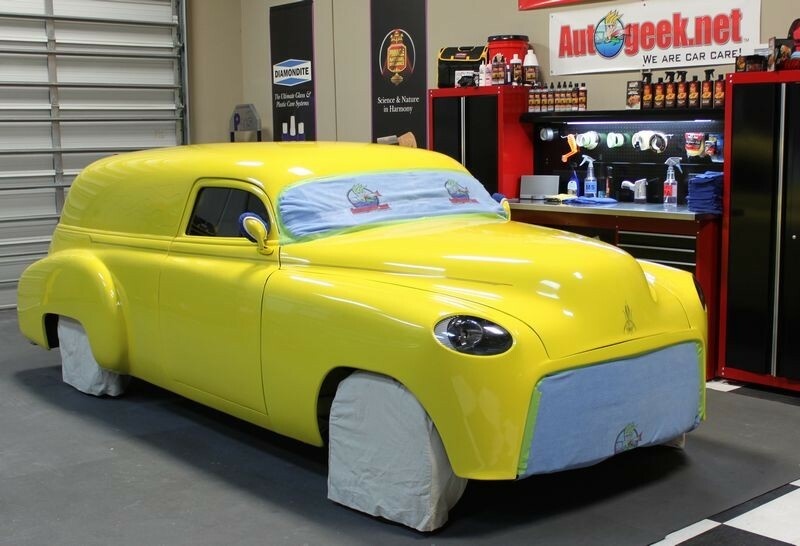 Find a custom car builder and if he does collision work let him do the body repair. I talk to a detail shop the tire shop owner wanted me to go to and he starts talking about taking off about half the clear layer and putting some product on it to build up the layer again and the buff it. Sounds like that acrylic “diamond coat” crap we used to sell at a dealership I worked at when I was young. Then he shows me a couple cars in his showroom (used car dealer also) they’ve used it on. Shiny? Yup. Defects everywhere? Yup. No thank you, I walk out the door and don’t look back. This person doesn't know what they are talking about. Avoid them like the plague. Well, first I need a buffer. After lots of reading I settle on the Dewalt DWP849X. Yes, I get the rotary vs orbital arguement for “beginners”, but the Dewalt rotary will fit more of my needs in addition to just the truck. Sure, there will be a learning curve, but I’m always up for learning a new automotive related skill. $250 makes a new one mine. Then I grab a yellow and a black 7/9” pad from SM Arnold. “Cool it” Speedy Pads they’re called. Then I pick up a 6” Velcro backing pad and one black and one yellow pad from “Farecla”, g-mop is the pad name. Keep in mind I’m not in a place where I have a lot of options for this stuff, so it’s more a “take what you can get and be glad you got anything” type of situation. I actually gave my input to DeWALT about 12+ years ago to help them with the design of the DeWALT 849X. That's when I worked for Meguiar's and posted to Autopia.org - they contacted me via Autopia.org. The 1974 Mercedes-Benz 450SL on the label of Ultimate Compound was detailed at a Thursday Night Open Garage or TNOG class taught by me. The 1991 e34 BMW M5 on the label of SwirlX was personally detailed by me for the 2002 Bimmerfest in Santa Barbara. So, long intro. Thanks for sticking with me if you're still reading. Wheel paint I've been told is a LOT harder than car paint. And this would match my experience trying to work on wheel paint. I have to make sure to wash my girlfriend's truck before she takes it in for any kind of service. The like to run it through their rollover car wash machine. It's a five brush (two small front side washers, two large rear side washers, and one top brush) unit that rolls over the car. Guaranteed paint defects every time. Excellent work with the camera captures. Horrible that they'd do that to someone. Our problem is when it comes to ship hoisting and when working in the rockies. Electric hoists tend to overheat when worked hard. Following a 400 foot ship in 60-70 foot waves with a man on the deck tends to get me working the hoist pretty hard. Same with pulling someone out of a 300 foot deep ravine. The danger spot for anyone is when they are on the cable. When I get them off the ground (or deck), its full speed in until I get them to the door. Same when evac-ing a sinking ship out in the Atlantic. By the time I’ve got half the crew off, the hoist is pretty hot. Switch and I’m right back to a full speed hoist again and can pull another 10-15 guys off the ship while the other hoist has a chance to cool. Time = life in SAR. A failed hoist and no backup is a serious situation when the world is coming apart around you. A hot hoist will default to 100 fpm instead of the full 350 fpm, an overheated hoist just stops dead in it’s tracks. I’ve had hoists overheat, foul and just plain fail on me. I’m not a big fan of electric hoists for SAR work, even less so on Breeze Eastern built electrics. They make them just too fragile for Canadian environments. Having two is very often the difference between bringing someone back....or not. When we flew the Labrador (CH-46 in US terms), the hoist was hydraulic. That thing was a beast. Never had one fail on me. If we broke or had to cut the cable, we could still use the hydraulic cargo loading hoist through the hell hole. Although we avoided that at all costs... center hatch hoisting was the last resort option when all else had failed. If I ever clear out some PM space, I'll message you. By klubbhead21 in forum Ask Mike Phillips your detailing questions! Body shop messed up this 2010 Camaro.. and I fixed it!